The last time I saw a vampire movie set in a wintry clime I was kind of bored. This time, I was riveted. 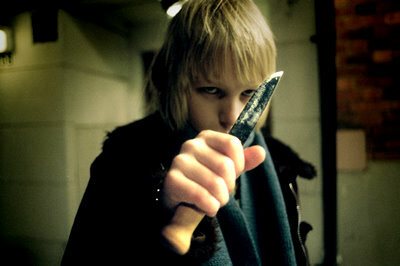 Let the Right One In is a stunner from Sweden, a coming of age tale about Oskar (Kare Heerbrant), a bullied 12-year old boy who makes a friend one night when he sits outside, sticking a knife into a tree. Sitting on the monkey bars is Eli (Lina Leandersson), a quiet child who watches him with interest and no fear. Her eyes speak of a deep loneliness, something Oskar understands, and they each see a kindred spirit. And yeah that’s a traditional Scandinavian knife. Oskar has no one to turn to; his mother seems harried and unable to deal with him. She’s of little comfort, and his father is not at home. When he does visit him, Dad is immediately distracted when a friend comes over for a drink. Oskar is pushed aside, and indeed seems to shrink into himself, trying to disappear. When he meets Eli, things change. She solves his Rubik’s Cube overnight (the movie is set during the ’80s), and delights and intrigues him. Soon she intrigues us as well. These are two child actors who are naturals, and we are swiftly drawn into their tale. It is a grim tale, in the same way Twelve and Holding is. It sets us in a childhood so dark and real that we question our own; could it have gone this way? Well, if we met a vampire, perhaps. We expect Eli to deal with the bullies, but a vampire has more than power, but the wisdom of age; the advice Oskar gets is from someone who knows the tyranny of the strong. The movie’s title comes from a vampire’s weakness of legend; they must be invited in. There are no stakes or garlic here, but Eli does live inside during Stockholm’s sparse winter daylight, solving puzzles, waiting for the sun to go down. It’s refreshing for such power to be tempered with weaknesses, something vampire stories have been loathe to do for a long time. John Ajvide Lindqvist’s original novel has much deeper detail, and there’s a brief scene you might find gratuitous if you don’t pay close attention. Other subplots are sheared away, and I think the movie is better for them; you can read wikipedia and decide for yourself. The movie is dark enough. 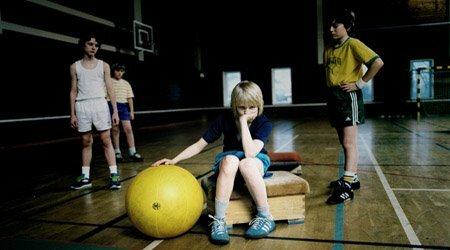 It is written by someone who understands bullies, and not just to use them as a plot point. There is even some laughter, but I’m not sure I’d call it Stand By Me meets Nosferatu, but if you need that sort of description, it’s as apt as any. It the mingles meat and bone brutality of a predator with quiet scenes of tenderness, such as when they tap in Morse code to avoid the sunshine (look at the IMDb trivia to find out what they say to each other). The ending is utterly perfect. Vampires are left a mystery, with powers beyond our understanding and limitations even they cannot explain. Unlike 30 Days of Night, where they stomp around like T.Rex-toothed Russian mobsters, here director Tomas Alfredson masterfully gives us hints of hideous strength without showing us directly. The Lost Boys might be fun, but seeing vampires fly and hang from their toes like bats was hilarious, and took any fear out of it. In this movie, you’ll be terrified of a 12 year old girl who might be tapping at your window, beckoning to be let in.